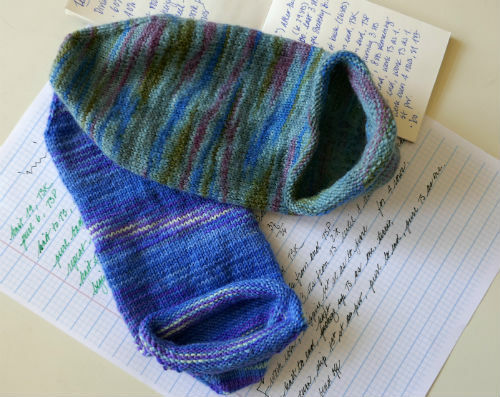 Remember when I was on a kick to knit my own tennis socks and fine tune the sock recipe? Yeah, it was fun. They wore really well. This summer, I wanted to make more. Guess what? What I wrote on the blog was the extent of my notes on the recipes. Seriously. That’s it. At least I had the blog to refer back to, I guess, or I’d have nothing. Nothing. This time, I’m making notes. There was a lot of ripping as I reconstructed the rolled rims. Hopefully, I won’t lose these notes. These socks are slightly different from the first set because I’m using fishy lips heels. That has become my favorite short row heel construction method.